← Which Guitar? Acoustic Or Electric? 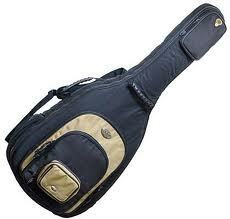 If you’re going to be taking your guitar into school you will definitely need a carrying case or cover of some sort. Many guitars aimed at beginners come with a soft carrying cover with a handle strap, but if you have bought a guitar that doesn’t come with one I would recommend you get one. They range from soft covers as mentioned, to padded ‘gig bags’ which are still soft and light but offer varying levels of padding and protection. There are also ‘hard shell’ cases which offer the best protection but are a little heavier, bulkier and they are the most expensive. For schools I’d recommend a padded gig bag as they are not too expensive but do a good job. Pockets are handy to for organising music sheets, books and any accessories. Typical Padded Guitar Bag or ‘Gig Bag’ with pockets and shoulder straps so the guitar can be carried like a rucksack. Handy when you have a school bag to carry as well. 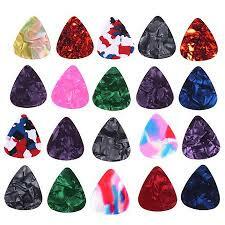 The plectrum is a small plastic tool for plucking the guitar strings. Sometimes referred to as a ‘pick’ or ‘flat pick’, or even ‘plucker’ by many children, they can actually be made from many types of material but plastic ones are the most common. Not all players use plectrums and instead use just their fingers. I play and teach both ‘fingerstyle’ and with a plectrum but I encourage all of my students to learn with a plectrum to begin with. Plectrums are cheap and come in thousands of different colours, designs and thickness gauges but are usually basically triangular with rounded corners, I would recommend using a ‘medium’ to ‘heavy’ gauge thickness as they offer better tone production, volume and control. Get a few as they can get lost easily, but also many children (and adults) enjoy having different colours, or ones with cartoon characters on, and this can be a collector-like hobby in itself! Guitars need to be tuned a specific way and although this can be done without a tuner, it is easier with a tuner, particularly for a young student or parent who doesn’t actually play guitar themselves. My personal recommendation is the ‘Intellitouch PT10’ clip on tuner which is simple to use, has a very clear and bright screen and is also small and neat. I only use that particular one and I have a few of them in various guitar cases. It will also tune any other instrument you can clip it to or rest it on. I use it for my guitar, mandolin, bass guitar and I’ve also used it on a banjo and a cello. It won’t actually tune the guitar for you, but it will make life easier when you come to do it. You can buy this for around £12 – £15. There a copies that look nearly identical and cost about £5 but I wouldn’t bother with them as I’ve found them to be not as accurate, and when you use them they feel and react like cheap copies. 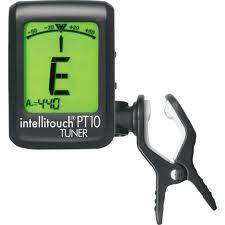 The ‘Intellitouch PT10’ Tuner I Have three! If you’re planning on standing up to play guitar you will need a guitar strap. Steel strung acoustic guitars and electric guitars usually come with ‘strap buttons’ attached so that a strap can be fitted to it with ease. Nylon strung guitars usually come without them due to the fact that in the classical style of guitar playing, players rarely stand up to play. However, if you want them your local guitar shop will supply and fit them for you. 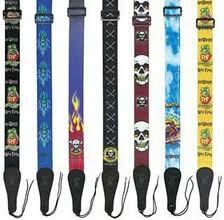 Guitar straps like the one’s pictured here come in many different styles and varying materials like cotton or leather. As you can see they often come with a ‘shoelace’ attached to one end. This is because a lot of steel strung acoustic guitars only come with one strap button attached to the body of the guitar. In these cases, players can attach the other end of the strap to their guitar head by tying the lace around it, under the strings.If you’re guitar has two strap buttons, you would take of the shoelace as it would be unnecessary. A capo is a device used to raise the pitch of the guitar strings by clamping on to the guitar neck at any fret position you choose. 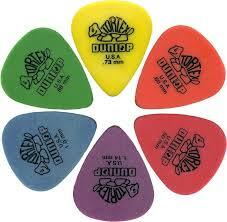 They are primarily used so that a guitarist can change the key of the song they are playing. This often means easy open chord shapes can be used to play songs in keys where the chord shapes may be more difficult. Often it is to make a given song more fitting with the preferred vocal range of a singer. 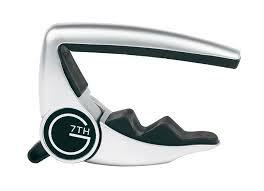 G7th Performance Capo is my current favourite although it is one of the more expensive capos. 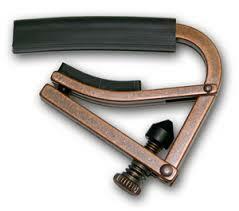 I also use a Shubb Capo which is very nice too and slightly less expensive than the G7th. There are many more even cheaper options available, and having tried most, I’d say they all seem ok so have a good look around. Image | This entry was posted in Private Tuition, Schools & Education and tagged free guitar lessons, guitar accessories, Guitar lesson, guitar lessons hazel grove, guitar lessons stockport, Guitar Teacher Hazel Grove, guitar teacher stockport, Kevin Burke, Kevin Burke Guitar, www.kevinburkeguitar.com. Bookmark the permalink.